i think it's nice to have a tight personal color palette- i wish i could be that decisive. i love the way it looks. oooh! beautiful piles and combinations. i love, love how everything is always so clean and white and simple here. you're an inspiration! of course I'll love it-your stuff being shipped tomorrow! Yay! oooh i do love to see your little piles of inspiration al, just gorgeous! 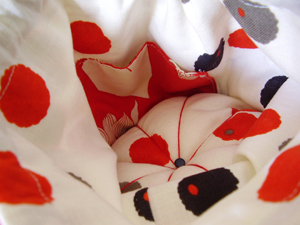 I love your fabrics, just beautiful and simple! Everything. Always. So. Beautifully. Made. Makes me happy to see. But I also admire the way you make your usual palette work so well for you. 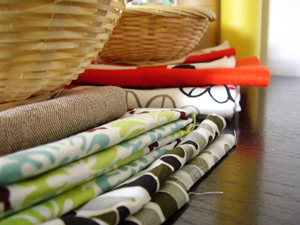 I love those fabrics you've picked for the baskets...and I have to confess I'd love to know how you do it. I think it's a fantastic idea! the little pincushion peeking out of the bottom of abby's bag is so nice! What a special gift! I love the red/black/white combo. lovely gift and beautiful fabrics!